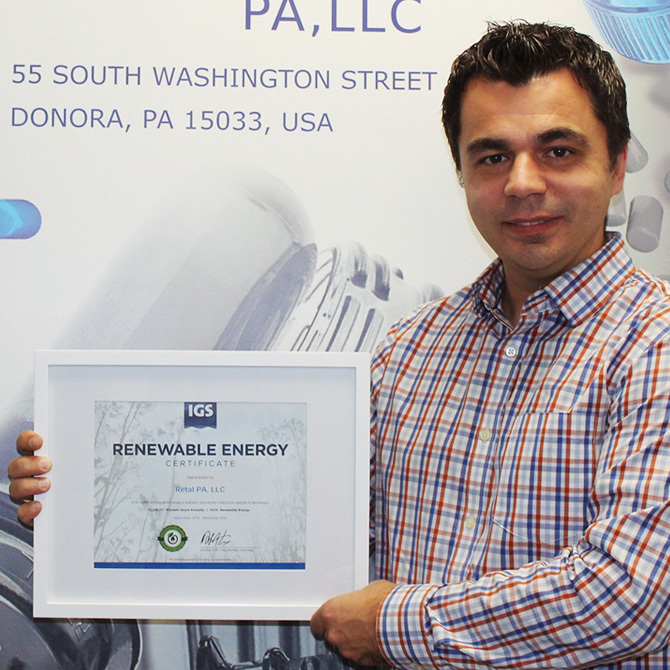 RETAL PA in the US is the latest RETAL factory to join its carbon footprint reduction activities, with general manager Admir Dobraca saying it has reached an agreement with power supplier IGS Energy to provide RETAL PA with 100% renewable electricity. IGS Energy presented RETAL PA with a certificate to confirm that all the energy supplied to RETAL PA is guaranteed to come from renewable sources. RETAL's President Anatoly Martynov is encouraging the company's sustainability push to continuously reduce its carbon footprint by taking real steps to protect the environment.